Please note that Kickstarter does not offer Paypal, but we have their permission to do so however, although your purchase will not count toward our Kickstarter goal, the purchase will be treated exactly the same by Lionheart Movies. Also, Kickstarter only allows a maximum pledge of $10,000 so we have included exclusive premium products on this page. If you are coming to this product page from Kickstarter.com to use the PayPal purchase option, all the products that are listed in Kickstarter are also listed on the right hand side of this page with the Paypal purchase option. While the product incentives listed are nominal compared to your pledge amounts, this is our way of saying thank you for your generous support of our monumental film. Tee shirts will be like the ones distributed at the first Teen Screen and our baseball cap will be like the one given to the crew during production. I am also offering my director’s chair that I used during the production of “South Dakota.” And of course we will have DVD’s and Blu-rays and posters etc. Thank you so much for generous support. Let your voice be heard and make it known that you’re standing for the cause! Pledge $1.00 and we will publicly thank you on our website! Every contribution helps. Will be listed in alphabetical order of appearance. Receive a digital download of a song that appears in the movie written and performed by Scottie Isac, and be listed and thanked publicly on our website. Receive a special edition digital poster of our film, the Scottie Isac digital download, as well as be listed and thanked publicly on our website. Receive a digital download of the movie once the theatrical release is completed, plus all of the preceding product incentives. Receive a hard copy of the movie poster signed by the director Bruce Isacson and the executive producer Howard Kazanjian, who produced “Star Wars the Return of the Jedi,” & “Raiders of the Lost Ark,” starring Harrison Ford. PLUS receive everything in $15 Pledge. 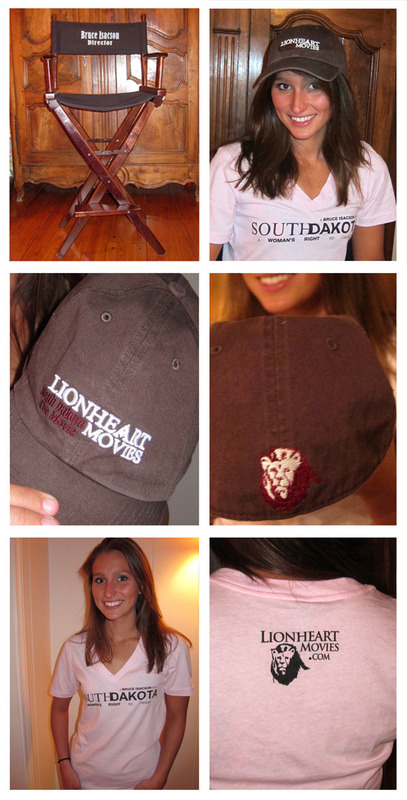 Receive a tee shirt with the movie title on the front and the Lionheart Movies logo on the back. Highest quality 100% cotton, v neck, your choice, pink or white, in extra small, medium or large. Also receive everything in the $25 Pledge. Receive a tee shirt signed by the director Bruce Isacson and the executive producer Howard Kazanjian, plus everything in the $50 Pledge. Stand up for what you believe in and do it in style, pledge $125 or more and receive AN OFFICIAL SOUTH DAKOTA the movie BASEBALL HAT similar to the one given to the crew on production with the lion logo from Lionheart Movies, plus receive everything in the $50 Pledge. Receive a baseball hat signed by the director Bruce Isacson and the executive producer Howard Kazanjian, as well as everything in the $50 Pledge. Receive a special edition DVD that will be shipped after the theatrical release of the movie and before the general release of the DVD to the public, plus receive everything in the $50 Pledge.. Receive a special edition DVD SIGNED by the director Bruce Isacson and the executive producer Howard Kazanjian that will be shipped after the theatrical release of the movie, plus everything in the $50 Pledge. Receive a special edition Blu-ray SIGNED by the director Bruce Isacson and the executive producer Howard Kazanjian, as well as everything in the $50 Pledge. Receive a copy of the screenplay, plus everything in the $50 Pledge. Receive a copy of the screenplay SIGNED by the director and executive producer as well as the special edition Blu-ray or DVD that will be shipped after the theatrical release of the movie, PLUS, you will receive the baseball cap and the tee shirt and everything in the $50 Pledge. Receive everything in the $500 Pledge, PLUS the Director and Executive Producer will SIGN EVERY PRODUCT received. RECEIVE A SPECIAL THANK YOU CREDIT IN THE END CREDITS OF THE MOVIE, Plus everything in the $1000 Pledge. YOU ARE INVITED TO A SPECIAL SCREENING IN LOS ANGELES AND DINE WITH THE DIRECTOR, BRUCE ISACSON AND WITH THE EXECUTIVE PRODUCER, HOWARD KAZANJIAN (Please note that airfare and hotel and expenses are not included in this incentive.) PLUS receive everything in the $5000 Pledge. ALSO, the first person that makes this pledge will receive the director’s chair that was used during production. You can see the Director’s chair in a photo above. THERE ARE MORE REWARDS but we can't post them here because they're too big! For premium rewards past a $10,000 Pledge, see www.southdakotathemovie.com/paypal, or if you want to use PayPal for any of the above rewards please go to the same website.